I am in process of buying an 1989 S4 Auto. The car's factory alarm is not going off. I know that it usually has to do with a contact switch at a door, hood or boot or else a ground or relay. The seller (dealer) is in the process of disconnecting it as they cannot be bothered to look for the root of the problem. I've looked at other threads on the alarm and see some of the causes/issues. 1) Will this potentially affect other performance (i.e. disable the car/drain the battery/etc.)? 2) Is there a preferred method to disabling it (i.e. fuse/relay/etc.)? 3) Should I try to fix it? If they don't care enough to fix it they probably don't care enough not to make it worse. If the car starts and runs as is, and you're going to buy it post-PPI then factor a dead alarm into the price, get it out of there and worry about the alarm later. How's the flex plate? Yes, the alarmn should trip if you lock the door, say with the window open, then reach in and pull the inner door handle and open the door. To shut it off, you close the and cycle the lock with the key. Whenever the doors are locked and the alarm is armed, LEDs in the door lock posts (from 89 on) should flash every few seconds. Sometimes slight misalignment of the door lock mechanism can prevent the alarm from arming or disarming as this is done by a cam and arm on the end of the lock tumbler, but the other door would not lock/unlock as this provides the lock/unlock pulse. A common problem area is the hood pin, mounted on a bracket right behind the right side end of the engine compartment crossbar. If broken or maladjusted, the alarm may trip at any time. Also, there is a pin switch in the hatch lock receiver as well. All of these work by grounding when open. 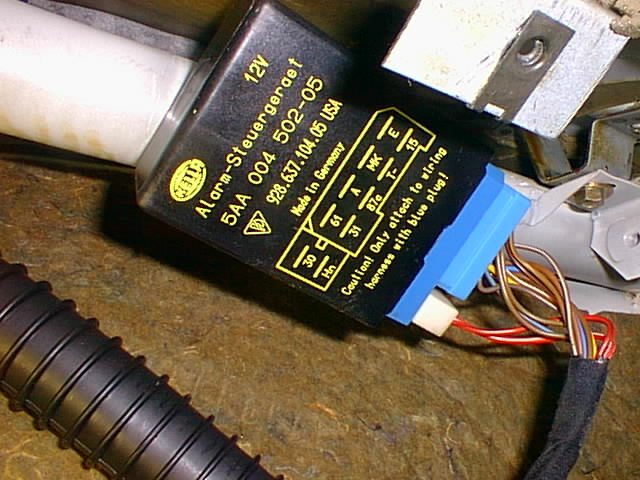 The common way of disabling the alarm on an 89 is to put a bypass jumper on the plug (shown as light blue below) to the alarm box that is hung or a crossbar behind the glovebox, which must be removed to get at it. You jump the plug connections that correspond to 15 and 87a shown on a diagram on the black box. Alternatively, you can leave this alone and jumper instead where the wiring from the alarm passes into the CE panel (don't have the CE panel plug positions for this handy at the moment...EDIT - looks like B23 to F25 for 89. This changed again in 90). This does no harm to the car other than disabling the alarm and assures that any malfunction of the alarm does not disable the car. Tripping the alarm or a defective alarm will kill power to the ignition and fuel systems so the car will crank but not start.